Hey there! I’m an online marketer and fundraiser living in Washington, D.C. I love understanding why people make decisions—why they say yes to an offer or unsubscribe from an email or make a purchase. I’m fascinated by psychology and how technology and experimentation can help us understand people better. This helps us marketers communicate better with each person we reach. These are the subjects of my frequent talks on online marketing and optimization, including at the Marketing Sherpa Optimization Summit, the Nonprofit Innovation and Optimization Summit, the Bridge Conference, and the Direct Marketing Association Nonprofit Conference. Most of the time, I can be found at the Leadership Institute, where I oversee online fundraising and drive marketing optimization. P.S. Opinions expressed on this site are my own. I don’t have comments enabled, so here’s how you can get in touch: Send me a tweet. Or find me on LinkedIn. I’ve been saying for years that email is the “killer app” for marketers and fundraisers. It enables real, personal engagement with your customers in a way that social media simply cannot. In 2011, Google created an artificial intelligence program called Google Flu that used search queries to predict flu outbreaks. Google’s data-mining program looked at 50 million search queries and identified the 45 that were the most closely correlated with the incidence of flu. It’s yet another example of the data-mining trap: A valid study would specify the keywords in advance. After issuing its report, Google Flu overestimated the number of flu cases for 100 of the next 108 weeks, by an average of nearly 100 percent. Google Flu no longer makes flu predictions. A better approach to data analysis, one that will return the most useful insights, starts with questions to answer and hypotheses to validate. The nonprofits and political movements that endure are those that build meaningful relationships with their donors. Yet the temptation remains to make decisions that are effective in the short run but catastrophic over time—to sacrifice long-term success for victory today. This is particularly true in politics. For political campaigns, what counts is winning the election; considering a future beyond Election Day is just a distraction. This can lead political fundraisers to eschew meaningful relationships with donors in favor of gimmicks, misleading language, and constant shrill appeals for money. These shortsighted tactics, a bipartisan affliction, are justified as being effective. Indeed, this approach may work quite well in the short run, drawing eye-popping returns that exceed anything from a more durable approach. Over the long haul, though, treating your donors poorly erodes trust. Donors will catch on eventually that the sky isn’t always falling. They will tire of the one-way relationship, disengage, and stop giving. 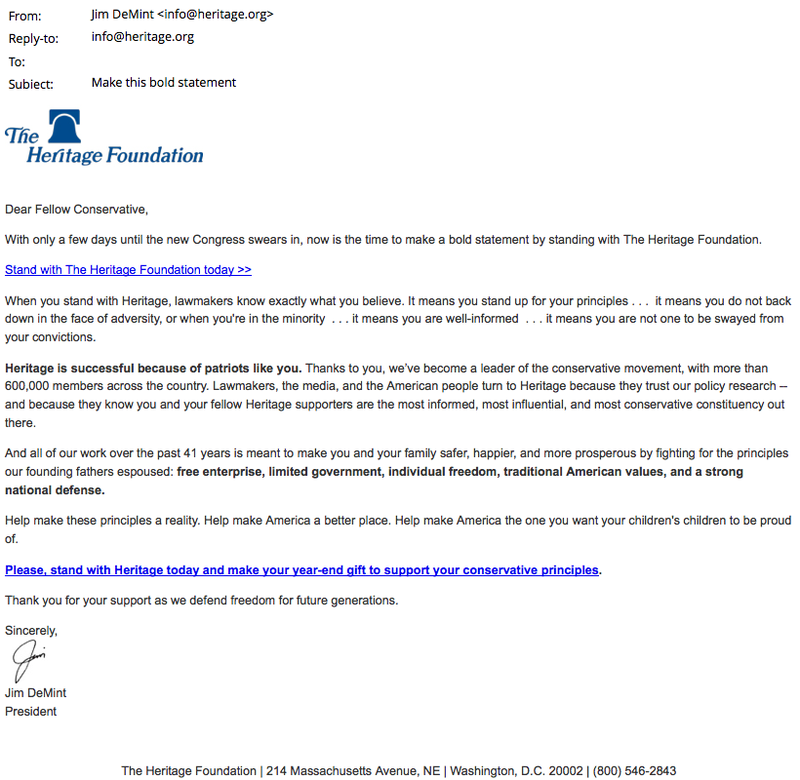 For years, every Heritage Foundation fundraising email was sent from our president. The appeals were sent on templates that resembled direct mail stationery, with the logo at the top. They even included a faux signature at the bottom. They were written in formal, authoritative language that we affectionately called “God voice.” “You are not one to be swayed from your convictions,” said one appeal, which called on donors to “make a bold statement” by making a gift. We sent emails that way because, we told ourselves, that’s what our donors expected. It’s what we had always done. But might it work better if the emails sounded like they were written by an actual person, not Fundraising God? This was a lesson the Obama campaign learned from some of their testing. So we set about testing it ourselves. Our hypothesis was simple: people give to people. No actual person writes like we were writing our fundraising emails. We created another email to test against our typical message. It came from our membership director and adopted a far more casual tone. And we stripped the fake stationery so it looked like a real person wrote it. We tested this head to head against the God-voice email above. The more informal language won. It wasn’t even close. The casual message generated 380 percent more revenue than the more formal appeal. The average gift alone was double! Better yet, because we tested a theory of the donor - that people are more likely give to people - we could extrapolate this approach to future appeals. This wasn’t a one-time win but a lesson we could apply going forward. Testing is fundamentally about learning and making decisions based on data. It’s about understanding who your donors are and what inspires them. Moreover, it reflects a humility — a recognition that we fundraisers don’t necessarily have the answers. Here was a team that ran circles around Mitt Romney when it came to fundraising. 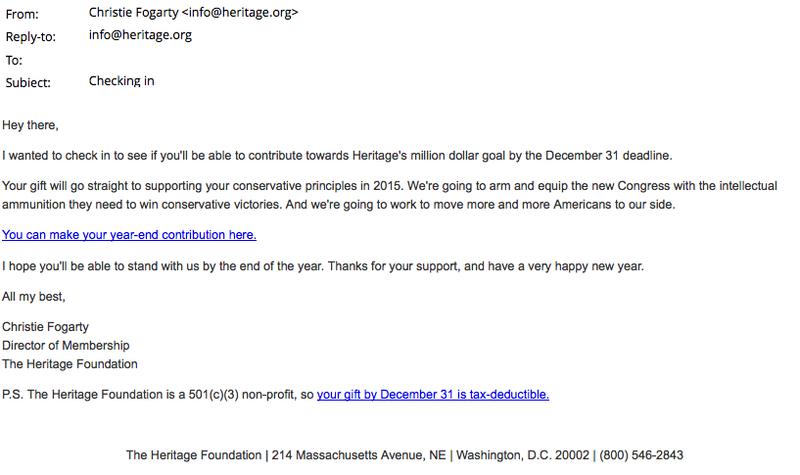 It turns out the campaign wasn’t run by a bunch of fundraising naturals who knew just what to send their donors. It’s not something you do at the last minute. It needs to be fundamental to your process. Testing needs to deliver results you can learn from and apply to your next campaign, and the one after that, and the one after that. Let’s think again about the 2012 Obama campaign. They famously tested their way into an email with the subject line of “Hey.” That email made huge sums of money. A lot of email marketers learned from that that they should send emails with the subject line of “Hey.” I got a lot of emails with that subject line in 2012. We tried one too at Heritage. It didn’t really work. The Obama campaign learned a different lesson, the right lesson. “The subject lines that worked best were things you might see in your in-box from other people.” That’s according to Toby Fallsgraff, the campaign’s email director. That’s a useful insight, because it’s about what their donors think and believe. It can inform future fundraising campaigns. When testing, you don’t want to test this word against that word. You want to test different theories of the donor against one another - theories about how your donors think and act. Nathaniel Ward is an online marketer and fundraiser in Washington, D.C. Get in touch at @nathanielward. Read more about me.